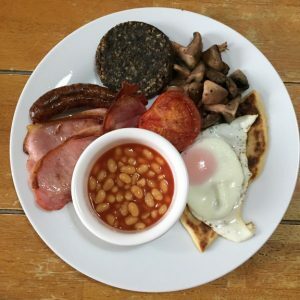 Breakfast is served between 7.30am- 9.00am daily and can either be a hearty traditional full Scottish or a continental option. I do ask that if you require a cooked breakfast you complete an order form the night before. This will ensure that your breakfast is ready for you. If you change your mind it’s not a problem it just may take a little longer. All of our meat & Haggis is supplied by local and award wining butchers J B Houstons. Our Eggs are also locally sourced. If you have any dietary requirement it would great if you could let me know at least 48 hours before your arrival so I can endeavour to accommodate your request.